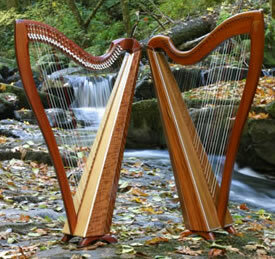 This page gives you an overview of the 5 harp models we offer. Each model also has its own page for more details. 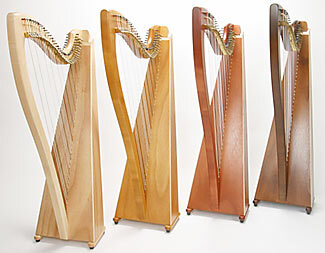 We now make 5 models of harps. The Swan, Cygnet and Serenade have 36 strings and the Clare and Ceili have 34. They are all fully levered with Camac levers, come with a case and a tuning key. Read a summary of each harp model below or click on the above links for model details with pictures. Our experience in working with classical and folk musicians from the novice to the professional player has led us to our current harp designs. All of our harps are designed for even string tension and concert spacing (the same string spacing found on most pedal harps). This medium string tension produces a full, rich tone that is balanced throughout the range of the harp, resulting in a harp that is responsive and inspirational to the player. THE SWAN is our premium model. Starting at $6295 with nylon strings, $6595 with folk gut strings and and now available with fluorocarbon strings for $6695. Shipping is $500 to anywhere in the US 46 states, $550 to Alaska, Hawaii, Maine, Florida and Canada. It has a staved back soundbox made of solid hardwood. Choices of woods include maple, walnut, cherry, and mahogany; and the exotic woods: bubinga, and koa. Other woods may be available upon request. It has a solid wood soundboard of spruce or cedar. The solid wood pillar is curved with a T-brace that is matched to the soundbox wood. The neck is piano pin block (also used on pedal harps) sandwiched between bookmatched pieces of wood that match the soundbox. 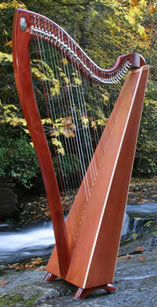 This harp can be made with Savarez fluorocarbon, concert gut, folk harp lever gut or nylon strings. The spacing is standard and the tension is medium-high, with concert gut strings having the highest tension, and folk harp lever gut strings having the lowest. It stands 57 inches tall and weighs between 23-28 pounds depending on the choice of wood. If you'd like we can shorten your harp by cutting the legs down by 2 inches. Compare the Swans in the photo above with the waterfall to the Swan in the photo at the top of the page (which has shorter legs). This harp can be adorned with inlay around the soundboard or on the pillar. See inlay options. All of our harps come with a padded Cordura case, a full set of Camac Levers, a tuning key, and an owners manual. We have recently redesigned this harp making the bottom C bass string easier to reac and a little lighter in weight. 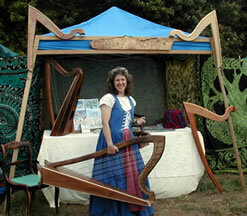 Hear Joanna Mell play a Thormahlen harp. All tunes except 4 are played on her Cherry Swan. THE Clare 34 is our newest addition to the Thormahlen Family. It has 34 strings and has an identicalstavedback soundbox as the Swan. $6295 with nylon strings, $6595 with folk gut and $6695 with Fluorocarbon strings.Shipping is $500 to anywhere in the US 46 states, $550 to Alaska, Hawaii, Maine, Florida and Canada. The solid hardwood options for the staved-back soundbox are the same as for the Swan: maple, walnut, cherry, and mahogany, and the exotic woods: bubinga, and koa. (See wood links above). The soundboard options are also the same as the Swan: spruce or cedar. The bass wires on the Clare are slightly shorter than on our Swan allowing us to use a shorter neck and pillar arrangement thus creating a smaller harp. The neck has the same construction style as the Swan, the pillar has a slight C curve. The Clare can be made with Nylon strings, Concert Gut, Folk Gut strings or Fluorocarbon strings. The Clare is 51 inches tall and weighs 21 lbs. It will fit in just about any car you might own. It is ideal for the harp player who wants to play in the Irish style. The string spacing is slightly narrower than our other harps and the folk gut strings give the harpist a light tension and a warm sound. We have recently redesigned this harp making the bottom C bass string easier to reach and a little lighter in weight. THE CYGNET is a baby Swan with the same number of strings (36) and the exact same staved back soundbox as the Swan. $6295 with nylon strings, $6595 with folk gut strings and $6695 with fluorocarbon strings. Shipping is $500 to anywhere in the US 46 states, $550 to Alaska, Hawaii, Maine, Florida and Canada. The bass wires on the Cygnet are slightly shorter than on our Swan allowing us to use a shorter neck and pillar arrangement thus creating a smaller harp. The neck has the same construction as the Swan, the pillar has a slight S curve. We make this harp with Savarez fluorocarbon, concert gut, folk harp lever gut or nylon strings. The tension is slightly lighter than the Swan especially in the lower end of the harp. Standing at 52 inches and weighing 22-25 lbs, this harp is ideal for those who just want a smaller, lighter harp with slightly lighter tension, for those who play in hospital settings, for smaller adults and children or for someone looking to fit a full harp into a small car. THE CEILI 34 has the same neck and pillar design as the Clare with a flat-back or semi staved back soundbox made of laminated Okume, which is an African Mahogany. It is similar to the Serenade in its construction and materials used. $3995 with nylon strings, $4295 with folk gut strings and $4395 with Flourocarbon strings. Shipping is $500 to anywhere in the US 46 states, $550 to Alaska, Hawaii, Maine, Florida and Canada. The Ceili comes with Savarez Flouocarbon, Folk Gut or Nylon Strings. We have just instigated a new stringing pattern for the nylon harps making the string tension lighter and the tone clearer and slightly brighter. It is basically lightening all the guages by 1 standard string gauge. The Ceili is 51 inches tall and weighs 18 lbs. It will fit in just about any car you might own. It is ideal for the harp player who wants to play in the Irish style. The construction of the soundbox is the same as the Serenade, the neck and pillar shape is also the same as the Serenade. There are six staining options on this harp: natural blond, amber, chestnut, walnut, and a very striking black stain (the black stain adds $200 to the price) and (see photos below). These are the same options as for the Serenade. 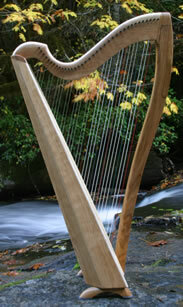 This harp can be adorned with maple binding or pearl inlay on the pillar or around the soundboard. If you're tall, you can get taller feet. The Serenade has a new pillar design (please go to our Serenade page to see what's new about it) with a flat-back or semi staved back soundbox made of laminated Okume, which is an African Mahogany. The neck is maple piano pin block, and more recently, to keep the weight at 20lbs, we make the pillar out of mahogany. starting at $3995 with nylon strings, $4295 with folk gut and $4395 with fluorocarbon strings. Shipping is $500 to anywhere in the US 46 states, $550 to Alaska, Hawaii, Maine, Florida and Canada. The Serenade uses the same nylon string set as the Swan and Cygnet and has the lighter tension like the Cygnet. The Serenade is available with Savarez fluorocarbon, nylon or folk gut strings. We have just instigated a new stringing pattern for all the nylon harps making the string tension a little lighter and the tone clearer and slightly brighter. It is basically lightening all the guages by 1 standard string gauge. The Serenade is 51 inches tall and weighs 20 lbs. It will fit in just about any car you might own. It is ideal for the harp student who wants to start with a less expensive and very nice instrument, for those who just want a smaller, lighter harp, for those who play in hospital settings, for smaller adults and children or for someone looking to fit a full sized harp into a small car. It would be a joy to any harper for a long, long time. Notice the new Cygnet style feet on the black harp in the photo above to the right that now come on all of our Serenades.Taller feet are available (add $200). Please note that the Serenade has a new pillar design that looks just like the Ceili harp. You can see it on the Serenade webpage (link above). 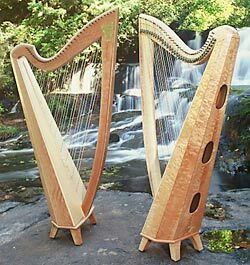 This harp can be adorned with maple binding or pearl inlay on the pillar or around the soundboard. We also have a special Serenade called The Black Pearl harp with soundboard inlay. The Serenade and Ceili are so light you can carry them by the pillar. The flat-back box fits very comfortably against your shoulder, however, because it was requested, we have designed a semi-staved back for this harp as well which gives even greater comfort. We have also just started making this harp with taller feet for the taller player. The Swan, the Cygnet and the Clare have the same full staved back solid wood soundbox. The Serenade and Ceili are available with a flat-back or a semi-staved back. All of our harps can now be strung with Nylon, Lever Gut or Fluorocarbon strings. The Cygnet and Serenade have the same neck and pillar geometry although the Cygnet neck is made like the Swan neck in construction with bookmatched wood sandwiching the piano pin block. The Clare and the Ceili have the same neck and pillar geometry although the Clare neck is made like the Swan neck in construction with bookmatched wood sandwiching the piano pin block. The Ceili and the Serenade neck and pillar are made out of the same materials and now have very similar neck and pillar design and construction. The 7 lowest bass wires are the same on all 5 models no matter what string type you order. We can shorten the feet on our Swan model or we can make taller feet for the Cygnets, Clares, Serenades and Ceilis. "Thank you so much for all of your help in selecting my harp. You have been a delight to speak with and very helpful. Your customer service is wonderful! Thank you again, Best regards, Serina B." We have had some requests for cloth harp covers. Here is a link for some very nice ones made by sisters Julianne and Coralie. They cleverly call them jackets, gowns, and tunics. Read what our customers have to say about our harps on the endorsement page. Here's a side trip you can take to learn more about shopping for a harp.